The X-Head_LC design benefits from "SuperTough" nylon technology successfully proven in use with the X-Head DOHC and SOHC models. With its blend of high impact strength, temperature and UV stabilization, the injection molded shell is designed to be slightly ductile in impact to prevent breakage. On the inside of the shell is a thermoplastic rubber liner that rests against the face of the cylinder to aid in dissipating impact force while preventing hard contact. Each side mounts via 2 stainless steel M5 T25 Torx Head fasteners and one T50 bolt. 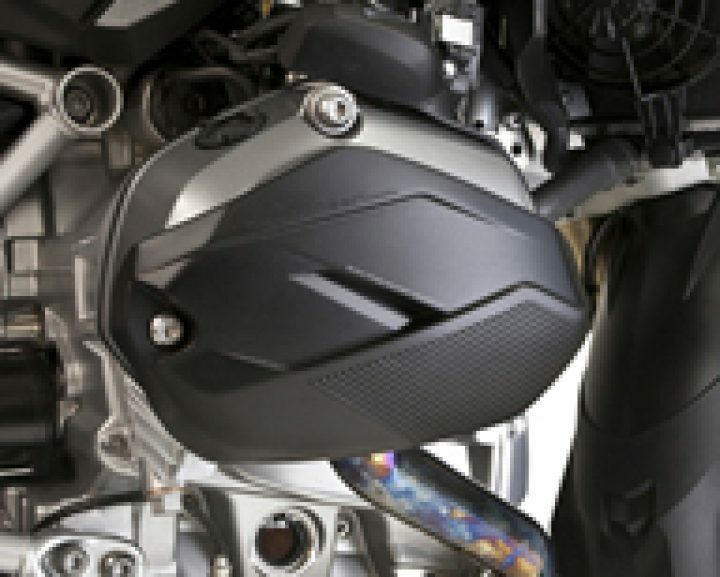 X-Head_LC are styled to complement the Liquid-Cooled models & are the best choice for riders who do not like the look of crash bars, especially on an RT, R, and RS. For GS off-road riding, X-Head_LC fits with crash bars to fill the gaps between the bars protecting heads from rocks and strike angles onto terrain that can get past the bars. X-Heads do not fit with Hepco & Becker crash bars. X-Heads have been successfully fitted with crash bars made by BMW, and Alt Rider. NOTE: Fit and compatibility of BMW or aftermarket brands of crash bars with X-Heads may vary, depending on their manufacturing size accuracy and any running changes the manufacturers may make over time. SW Motech bars fit properly on the right side but clearance is less on the left side because of manufacturing tolerance differences side to side.